The Motive Batch Processor is a separate stand-alone Windows application, built on the new NMotive scripting and programming API, that can be utilized to process a set of Motive Take files via IronPython or C# scripts. While the Batch Processor includes some example script files, it is primarily designed to utilize user-authored scripts. Initial functionality includes scripting access to file I/O, reconstructions, high-level Take processing using many of Motive's existing editing tools, and data export. Upcoming versions will provide access to track, channel, and frame-level information, for creating cleanup and labeling tools based on individual marker reconstruction data. You are welcome to use the source code as a starting point to build your own applications on the NMotive framework. Take files that will be processed. Launch the Motive Batch Processor. It can be launched from either the start menu, Motive install directory, or from the Data Management pane in Motive. First, select and load a Batch Processor Script. Sample scripts for various pipelines can be found in the [Motive Directory]\MotiveBatchProcessor\ExampleScripts\ folder. Load the captured Takes (TAK) that will be processed using the imported scripts. Click Process Takes to batch process the Take files. The Motive Batch Processor can run C# and IronPython scripts. Below is an overview of the C# script format, as well as an example script. Result ProcessTake( Take t, ProgressIndicator progress ). In the [Motive Directory]\MotiveBatchProcessor\ExampleScripts\ folder, there are multiple C# (.cs) sample scripts that demonstrate the use of the NMotive for processing various different pipelines including tracking data export and other post-processing tools. Note that your C# script file must have a '.cs' extension. Batch Processor Script C# Sample (ExporterScript-C3D.cs): Exporting a take to C3D format. /// Motive Batch Processor script for exporting a take file to C3D format. /// The <c>ProcessTake</c> function is from the <c>ITakeProcessingScript</c> interface. /// directory as the take file, and has the same name, but with a '.c3d' file extension. // options. We will write C3D data for markers and assets. // take file and have the same name as the take file, but with a '.c3d' extension. // Do the export and return the Export functions result object. IronPython is an implementation of the Python programming language that can use the .NET libraries and Python libraries. The batch processor can execute valid IronPython scripts in addition to C# scripts. IronPython Version: There is a known issue with IronPython 2.7.7 in some cases where the batch processor hangs when attempting to process the data. We recommend using IronPython version 2.7.6 or below. The following illustrates a typical IronPython script format. # Import everything from sys and NMotive. # Define the ProcessTake function. In the [Motive Directory]\MotiveBatchProcessor\ExampleScripts\ folder, there are sample scripts that demonstrate the use of the NMotive for processing various different pipelines including tracking data export and other post-processing tools. Note that your IronPython script file must have a '.cs' extension. The following script performs a trim tails operation followed by a filtering/smoothing operation. If both operations succeed, the resulting take is saved. # Import everything from NMotive. 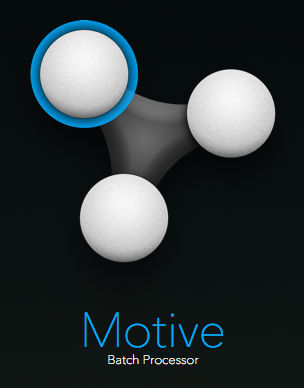 # Motive Batch Processor UI. # Create an NMotive TrimTails object to perform the tail trimming operation. # progress that will be rendered in the UI. # Set trail trimming options. # And execute the trimming process. # object will be displayed in the UI. if not trimResult.Success: # If trimming failed, return without saving the take. # Create the NMotive filter object. # the progress object to the filtering object. # Set the cutoff frequency and filter. if not filteringResult.Success: # If filtering failed, return without saving the take. # If we get here trimming and filtering succeeded. Save the take file. This page was last modified on 27 June 2018, at 14:15.